Gaza terrorists fire at least 70 rockets at southern Israel. IAF attacks vehicle of terrorist squad. A rocket exploded overnight Wednesday at a home in the Ashkelon Regional Council. There were no injuries, but damage was caused to the building. Earlier, at approximately 1:00 a.m., two rockets exploded in Sderot, one in the vicinity of a factory and the other at the entrance to a home. There were no injuries but damage was caused. IDF aircraft on Wednesday night fired towards a vehicle used by a Gazan rocket launching squad to launch a rocket at Israeli territory. 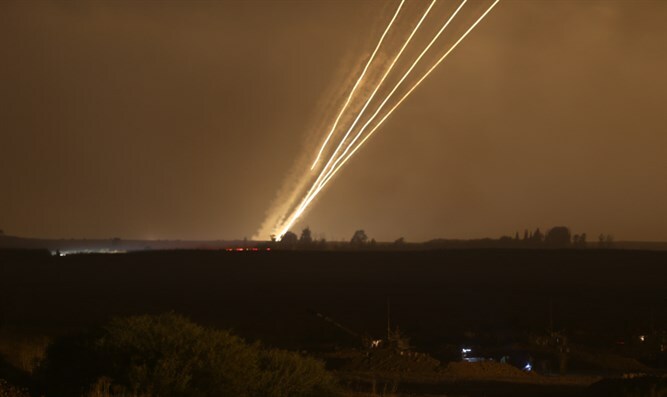 The IDF Spokesperson’s Unit said shortly after midnight that, over a period of five hours, approximately 70 rockets were launched from the Gaza Strip at Israel. The Iron Dome aerial defense system intercepted 11 launches, the majority of the rockets hit open areas. At least two people, including a 13-year-old boy, were injured in Sderot during the initial barrage of eight missiles. Earlier on Wednesday, the IDF struck 12 targets in Gaza in retaliation for the rocket barrage. The targets include a tunnel-part and concrete factory, an offensive maritime terror tunnel shaft along the coast and several terror sites in military compounds throughout the Gaza Strip, among them rocket manufacturing facilities and a central logistical military complex.